1. Beauty is as beauty does. The pretty female goldenrod spider lurks among flower petals, camouflaged by her colour. She has the amazing ability to change that colour to match her yellow or white home, although the process of changing to yellow takes anywhere from 10 to 20 days. It takes another six to change back to white. 2. She lurks in silence. This spider is not very energetic. She sits silent and immobile, often for days or even weeks, and waits for her prey, usually flies or bees or even other spiders. She goes for the jugular (or its insect equivalent) inserting her fangs in her victims' necks and injecting them with paralyzing and liquefying venom. 3. Is it a flower or a. crab spider? Misumena vatia, the formal name of our pretty spider, has, if she is female, a white or yellow abdomen and head (cephalothorax) from which the legs are attached, with two bright red stripes on either side of her abdomen. Some people believe that the purpose of these stripes is to act as a signal to bees. The "chevrons" supposedly look like a flower's landing signal to a bee, directing it to the nectar and pollen, when in fact it is simply the crab spider waiting, waiting. then!!! Mrs. Goldenrod Crab spider can be irresistibly attracted to her mate, but only when she is ready. If it's not her time, spider beware! She will devour any lurking male or other spider that comes within her reach. When she is ready, watch out. She is really up for it. The male can even bind her in his silken threads to keep her still while he has his way. Otherwise, neither he nor she has much use for the silken thread they can spin, except as an escape route to get away from a predator or to return to a favourite flower. In her case, she also uses her skill to spin a warm cocoon for her progeny. Crab spiders do not produce the traditional web. 6. Does "crab" describe their nature? The crab spider is so named because of the way it moves: sideways, as well as backwards and forwards. In addition, the front legs of the crab spider are long and strong like that of a crab. They are quite useful in seizing, holding and manipulating prey. The crab spider also lifts these front legs as a signal that it is ready to attack. 7. The better to see you with, my dear. The crab spider has eight eyes that primarily act as motion detectors. They can see all around themselves courtesy of the eyes mounted on bumps to give them a better look in all directions. Mama crab spider lays her eggs in a rolled leaf which she sews together with her silken threads. Then she guards her brood until they are ready to hatch in order to help them find their way out. After that, it's game over. The offspring are on their own and juveniles can spend a cold winter on the ground. They emerge as tiny spiders who molt several times before reaching adult size. 9. Daddy was a carpenter. 10. Citizens of the world. 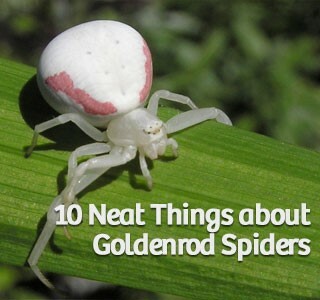 Crab spiders are found everywhere in the world, but the pretty goldenrod spider is found only in North America and Europe. They are so good at camouflage that most people never see them. Look closer next spring, summer and early fall. They are quite lovely and while they can give you a small bite, they are not dangerous to people.